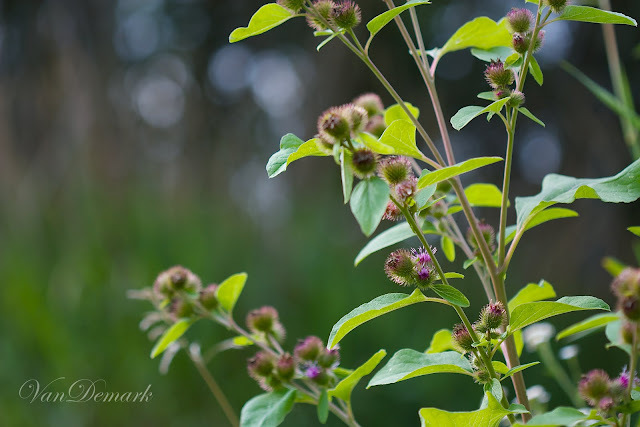 I found Burdock in the corner of a quiet lot. as it is a biennial thistle and considered an invasive species in North America. and its tap root is a popular root vegetable in Asia. 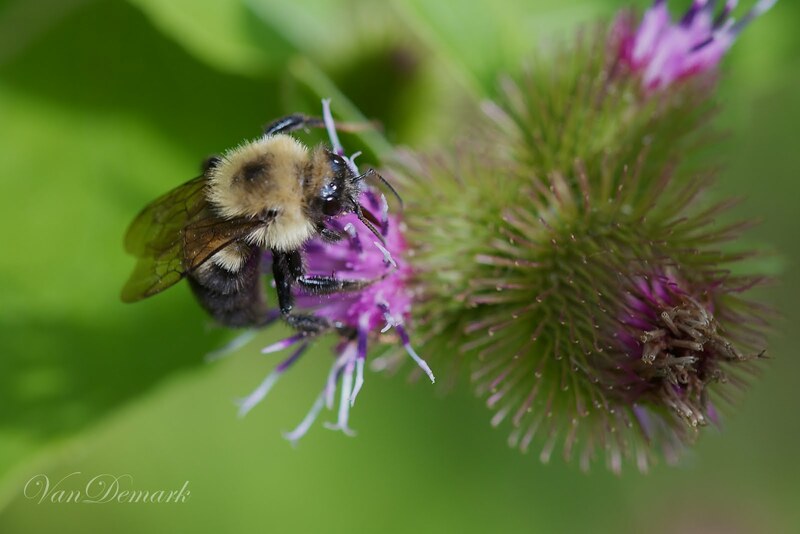 The most interesting fact about Burdock is its link to Velcro. and to the dog's fur. and he realized that the same approach could be used to join other things together. In the end, quite an inspiring plant! Linking at The Creative Exchange and Macro Monday. Truly stunning pictures... back in the day when I was a little girl in Scotland we drank a soda called Dandelion and Burdock... it was delish!! 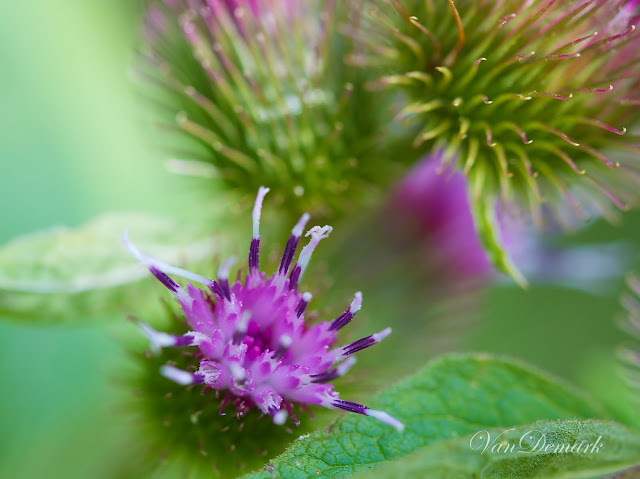 Oh my goodness, I never knew that about Velcro Anna, and I am one who does not see this beautiful plant as a weed. It is a wonderful plant to photograph as you have so beautifully shown here. These photographs are gorgeous! Gorgeous shots...very interesting! Thanks for sharing!! these are lovely shots, you always hear about dandelion and burdock, makes for a great photography subject! I love the purple flowers on this little plant. Great shots. Have a great day! What stunning photos and thanks for the info. about Velcro! Nice to meet you! I'm really loving your photography and this is just stunning! Magnificent quality! Thank you!!! Thanks for helping me see the beauty in this "weed." 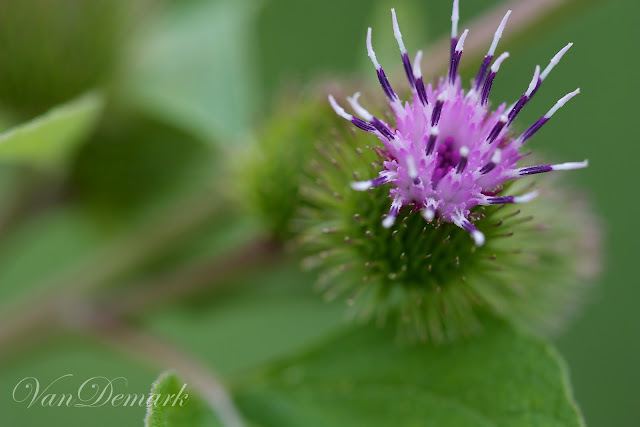 Your macros are wonderful, and I learned a lot about this plant -- great post! i always learn something interesting when i come here. great shots! Gorgeously wonderful and fantastic focus! Wow these are gorgeous shots and what an interesting information. Gorgeous color and details in these macros. 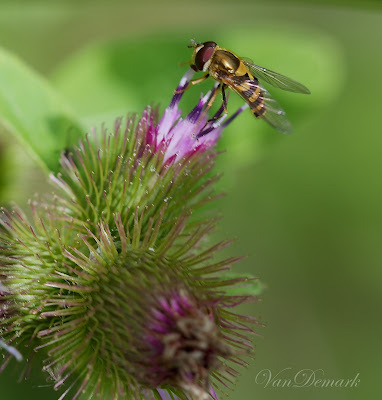 Wonderful photos, nice colors and details from the flower and the bee. nice work I have to say. It is strange about thistles. Just a quick look at them and tehy look nasty. But going close, they are really beautiful. Fascinating little bits about this flowering plant. And - I guess all of today's great inventions originated themselves in nature. Wonderful images!!! thanks for showing us the beautiful side of burdock. and it is. beautiful. aggravatingly beautiful. happy Tuesday to you Anna! Thanks dear Anna for this beautiful moment magic when I came here! I do like the flowers on burdock, but not the stickers. Very informative piece. 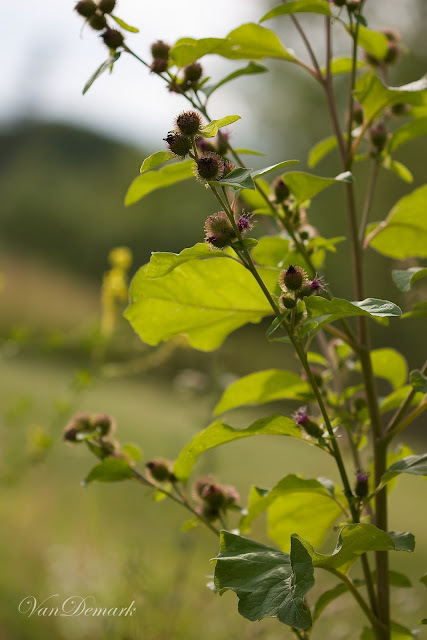 I had no idea dear old burdock was such an inspiration. Your photos are beauitful. My little dog used to get into these ... what a mess they would make. Beautiful pictures. I'm always amazed how nature finds a way to distribute itself. but these little seeds are so aggravating to remove! Well, I actually DO like thistles and these are lovely photos, Anna! I did know the story about the inventor of velcro but not that it involved this exact plant. VELvet and CROchet was how he named it. Thank goodness he had that walk with his dog! Ugh. Now I have serious Macro envy. :) Gorgeous photos. a lovely series in your blooming garden and Learned something as well ! !